“We have become 24/7 creatures in a 24/7 society”: an interview on sleep with Fred W. Turek, Ph.D.
Dr. Fred Turek is Director of the Center for Sleep and Circadian Biology at Northwestern University. He holds a BS in biology from Michigan State University and a PhD in biology from Stanford University. 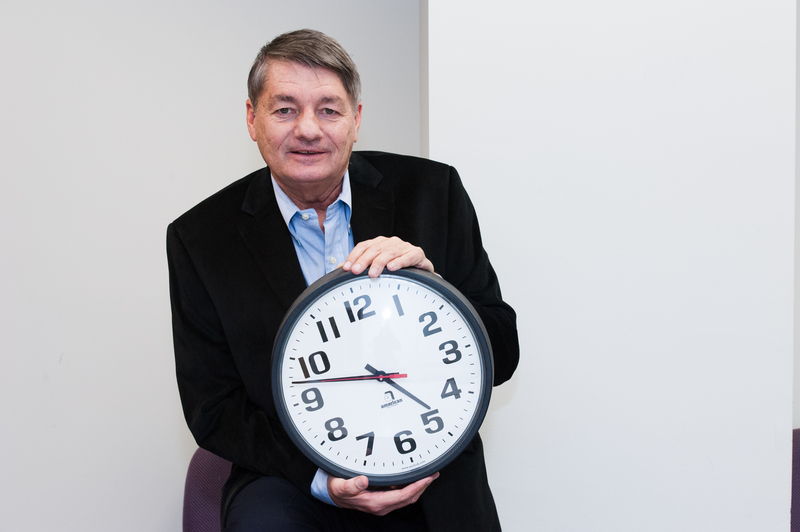 Dr.Turek’s current research focuses on the genetics of the circadian clock system, the effects of advanced age on behavioral and endocrine rhythms, the links between sleep, circadian rhythms and energy metabolism, and the role of melatonin in modulating sleep and circadian rhythms. Said another way, he’s the expert on all things sleep-related. Dr. Turek, during your lecture in Chicago about circadian rhythms and sleep, you talked about how modern life ‘battles’ ancient drives and Mother Nature. Could you explain more about that? Yes, the ancient drives refer to the fact that we evolved on this planet for millions of years with one dominant feature of the environment: the relentless diurnal or 24-hour change in the light/ dark (LD) cycle, which is due to the rotation of the Earth on its axis. This results in most of the Earth facing the sun and its light and warmth at one time of day, and later, that same part of the Earth is in dark and colder. Like all other living organisms, we evolved internal biological clocks, which have a period of “about” 24 hours (the internal clock has a circadian period that is about 23-25 hours in length). This internal clock is synchronized to the 24-hour external day night cycle, and until Edison came along about 125 years ago, the human internal clock was in lock step with the LD cycle. We were awake and active during the light/day and asleep and generally inactive during the dark/night. However, over the last century, we have become 24/7 creatures in a 24/7 society, and we are often not paying attention to signals from our internal clock. Indeed, we are doing battle, if you will, with our internal 24-hour biological nature. You’ve mentioned it was discovered that the daily rhythm of melatonin could influence other rhythms in animals. How has the research evolved since then? I would say that research into the role of melatonin in regulating circadian rhythms, particularly in mammals, was slow, but has picked up speed over the last decade. While we still do not understand the overall function of the robust 24-hour melatonin rhythm (melatonin levels are low during the day and high during the night in all species, including humans), it appears to act as a mild hypnotic, at least in humans. Perhaps more importantly, it appears to act as a circadian organizer that links other 24-hour physiological and behavioral rhythms to one another. In that Chicago lecture, you said, “When the clock stops ticking, metabolic syndrome explodes.” Can you share more about that? That clever title came from Dr. Bart Staels in a short opinion piece he wrote for Nature soon after we published a paper in Science (2005). The paper demonstrated that animals carrying two copies of a mutated core molecular circadian gene (called Clock) can lead to the loss of all circadian rhythms, as well as increased weight and signs of the human metabolic syndrome: increased visceral obesity, insulin resistance and hypertension. You make the point that, while the master circadian clock is located in the hypothalamus of the brain, 10-30% of the genes throughout the entire body are under circadian control. What does that mean in terms of how the “clock” affects health and disease? Let me preface the answer to that question with a little background: Up until 10-15 years ago, researchers in the field thought a master circadian clock regulating all of our 24-hour rhythms was located in the hypothalamus, and that few other areas of the brain or peripheral tissues were capable of generating their own circadian rhythms. With the discovery of many of the genes and their protein products that make up the molecular 24-hour clock came the surprising discovery that the molecular clock machinery was actually in all the cells, tissues and organs of the body. Equally surprising were recent discoveries indicating that this cellular circadian clock is regulating the timing over 24 hours of somewhere between 10-30% (and perhaps up to 50%) of all the expressed genes in a particular tissue or organ. We call these genes “clock controlled genes.” What happens if that clock machinery breaks down, say in a disease state or with advanced age, in a particular tissue or organ? That is a question that we and many other laboratories are trying to answer right now. Humans, as in all animals, are not only spatially organized, we are also “temporally organized,” and a breakdown of that temporal organization, maybe only in a particular organ (lung, liver or pancreas, for example), could lead to disease in that particular tissue, even if all the other parts of the body have clocks running normally. At one point in your lecture you went as far as to say, “I think insomnia is causing depression.” Could you elaborate on that? I used such a direct statement since for years the importance of insomnia for causing or contributing to depression has been on the back burner of thinking in the field – with the dominant thinking being that depression causes insomnia. When I first wrote that statement, I was trying to be provocative, but in reality I believe it is likely that insomnia may be a contributing cause to at least some forms of depression, as well as perhaps increasing the severity of the symptoms of depression. Many PatientsLikeMe members are living with conditions that may be impacted by sleep problems. Or on the flip side, their conditions might be impacting their sleep, right? Absolutely: It is a two-way street. It is now clear that many, many mental and physical disorders are associated with poor sleep. Of course, there is the cause and effect or rather the chicken or the egg question: Which came first? In one sense, I am less interested in the answer to that question than I am in the question: If I treat poor sleep or insomnia in someone with a given condition, will I have a positive benefit for the treatment, prevention or even cure for the condition? So, then, do you see a connection between the sleep we get and the conditions we live with? Yes, PatientsLikeMe members should treat obtaining adequate sleep as a top priority in their lives – do not “cheat” on sleep. And if you are having trouble sleeping, perhaps due to your condition, tell your doctor about your sleep problem, and seek ways to remove that problem from your life.